This was a program from the 1980's that we were forced to go through in school. Yes, forced! It was really awful for a lot of us, very discouraging... while for others I'm sure it was very encouraging! It convinced me forever that I couldn't do push-ups (and until a personal trainer helped me figure them out, I couldn't!). 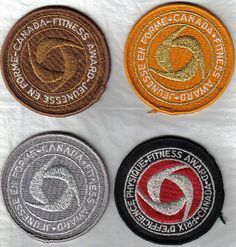 At the end you got one of 4 badges - Excellence, Gold, Silver, Bronze. I have some somewhere, Bronze and Silver. Could never lick the full thing. I feel like I have unfinished business. Thankfully someone posted the tests on-line! PDF document is here. I want to do everything at the 18-year-old level (the highest). This was meant to test kids, but at 18 they're pretty much adults, right? Voting and drinking and stuff! I'm going to set a baseline in the next few weeks (once I'm over this GD cold!) and then do it again in the summer. Hoping I can get to Excellence! It's going to be tough tough tough. Excellence - must achieve Excellence in all 6 disciplines! I'm pretty confident I can get to silver level in at least a few of these... we'll see though!